The Upper Midwest experienced an almost ideal growing season in 2016. Timely rains made for a beautiful corn crop—until harvest time. Corn silage harvest was extended in many areas because of rain and storms. Starting and stopping resulted in variable moisture and maturity levels, much of it on the dry side. Predicting how this silage will feed and keeping up with the variability can present a challenge. Of course, the Midwest is not alone. I know from working in Florida corn silage variability can be the norm. We know corn silage becomes more digestible the longer it ferments. We also know dry corn silage doesn’t “milk” very well, even if it’s well processed. Corn silage starch rumen degradability increases with time and typically peaks about six months after harvest. However, drier silage takes longer. Starch digestibility of kernels harvested at black layer might drift for a year. In vitro, seven-hour starch digestibility (IVSD7) helps predict the rate of starch digestibility in the rumen. This rate, or Kd, is used by modeling programs like CNCPS 6.5 to help predict milk production. IVSD7 can be determined by NIR, so quick turnaround is possible. However, if you want to use the IVSD7 to predict Kd and milk production in modeling programs, the corn silage sample must be oven dried—not microwave dried. This will take an extra day at the lab. Microwave drying will over estimate IVSD7 by several points. Don Sapienza of Pioneer Hi-Bred International showed several years ago microwave drying disrupts the starch granules and the starch-protein matrix. Basically it fries the starch, kind of predigesting it so the rate and extent of starch digestibility is increased. Oven drying is low and slow like a Texas BBQ, so it keeps the starch-protein matrix intact. Check with your forage lab to see which drying method they use or have been using. We have seen 10 to 20 points lower IVSD7 when the sample is oven dried versus microwave. If your corn silage IVSD7 has been coming back in the low 90s, it’s probably microwave dried. 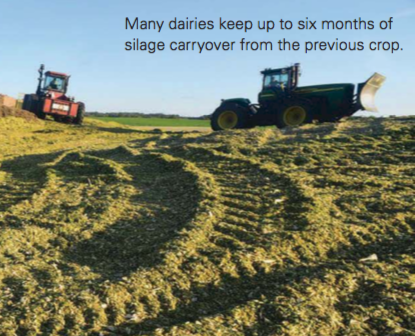 Many dairies keep up to six months of silage carryover from the previous crop, allowing the silage to stabilize and the starch digestibility to maximize before feeding. By the time you read this, most of the 2016 crop will have been in the bunker for almost that long. If you’re fortunate enough to have six months carryover, you might only need to run an IVSD7 once or twice after you open it to get a good reading on your crop. But if you’re like many dairies in the Upper Midwest, variable dry matter in the crop might force you to continue to monitor starch digestibility as you feed the silage, adjusting the starch in the TMR as you go. If you have been monitoring starch digestibility and find out the samples were microwave dried, the comparative dif- ferences can still be useful for looking at relative changes. It just won’t be accurate for milk prediction in programs such as NDS and AMTS based on the CNCPS 6.5 model. Rick Lundquist is a professional member of the American Dairy Association and certified in Animal Nutrition.